HousingWorks Austin is dedicated to providing the necessary research for leaders in our city to make the best affordable housing policy decisions. Our district-by-district analysis serves as a snapshot of the housing issues facing our community. 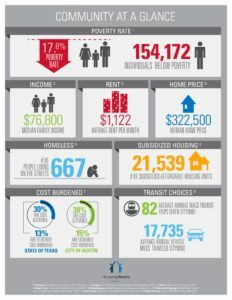 For the second straight year, HousingWorks Austin has explored household affordability, utilizing a wide range of data sources, from a variety of angles. We found some similarities across all 10 districts and some distinct differences. Click on the image displayed to the right to download the entire set of analyses and the Community at a Glance. CLICK HERE to view all the analysis for each district individually.